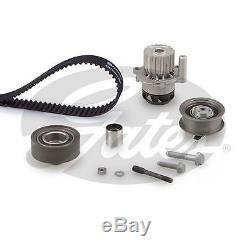 GATES KP25543XS-2 Water Pump & Timing Belt Kit. Note 3: Driven unit: camshaft. Note 6: No of Teeth. GET THE CORRECT PART FIRST TIME. PLEASE MAKE SURE YOU CHECK THE NOTES SECTION TO THE LEFT OF COMPATIBILITY TABLE. IF IN ANY DOUBT PLEASE ADVISE A REG NO OR ASK SO YOU GET THE CORRECT PART FIRST TIME. Here is listed any vari. Ations of Gates Products for your vehicle. A badly functioning timing belt drive system can cause serious problems and it is highly probable that the source of damage to one element in the drive will also have affected the other drive components. The best way to avoid expensive premature failures is to change timing belts, idlers and tensioners all at the same time. A Gates PowerGrip® Kit provides all the appropriate components plus installation instructions in an all-in-one kit and every component in the kit is a guaranteed OE equivalent part. A PowerGrip® Kit is handily packed in a sturdy cardboard box and contains, depending on the application. Belt tensioner(s) or tensioner assemblies. Other parts needed for a complete overhaul bolts, springs, etc. In many cases, it is recommended to replace not just the timing belt and the metal components, but also the water pump. Many water pumps are driven by the timing belt. If the water pump fails, coolant will leak and contaminate the belt. Long-term coolant contamination will eventually lead to premature timing belt failure. Thanks to the PowerGrip® Kit Plus Water Pump concept, you have all the elements necessary for a complete overhaul in one package, fit for the application. A PowerGrip® Kit Plus Water Pump offers. The same elements as a PowerGrip® Kit PLUS. The application-specific OE quality water pump with its O-ring where applicable. Thanks to their high strength and low weight, combined with long life, low noise and fuel consumption advantages, Gates timing belts are used extensively for driving the camshafts of modern automotive engines. This is a demanding task, requiring correct tensioning to ensure that belt performance is maintained at the optimum level. Tension is provided by a tensioner, which is either fixed or automatic. With a fixed tensioner, the installer needs to make sure it is installed correctly in order to provide the correct tension. Automatic tensioners, on the other hand, adjust themselves in order to maintain constant tension. Automatic tensioners are designed into the belt drive system for several reasons: Proper tension is maintained throughout the belt life. They increase belt life because the belt is maintained at an ideal tension under all conditions. They eliminate the need for a relatively difficult tensioning operation during installation, so the belt is always installed at the right tension and stays there! Car manufacturers are looking to make vehicles lighter using more lightweight components. At the same time modern engines are becoming more powerful. More power means more strain on the lightweight components causing more vibrations. To address this, vehicle manufacturers have replaced the ordinary crankshaft pulley with torsional vibration dampers which absorb vibrations from the crankshaft and extend the life time of other components in the drive system. They are vital in keeping the crankshaft and engine working properly, so you need replacement products of the highest quality. As a complete system supplier, Gates offers you a wide range of OE equivalent DriveAlign® torsional vibration dampers that fit the application perfectly and cover all the major models in the market. OE fit and function Cover all popular applications. We pride ourselves on a quality service and we are happy to address any concerns. The item "GATES KP25543XS-2 Water Pump & Timing Belt Kit" is in sale since Saturday, September 19, 2015. This item is in the category "Vehicle Parts & Accessories\Car Parts\Engines & Engine Parts\Other Engines & Engine Parts". The seller is "mjd128" and is located in Leatherhead. This item can be shipped worldwide.